I realise that this is way off topic, but I am posting it just in case it might help someone out there. I was just getting involved with digitising old movie film, by projecting it, then 'shooting' the result with a digital camera, when the bulb in the projector ceased to function. 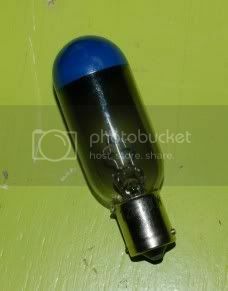 Much searching revealed that these bulbs are not available, at least in this part of the world. 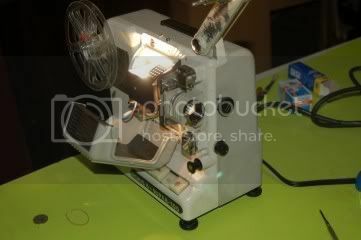 What are things coming to?- the projector is only fifty years old and already they have stopped making spares for it! There is always a solution to a problem. The lamp has a Small Bayonet Cap fitting, which just so happens to be the same as most automotive tail lamps. All I need is a 12 volt, 100watt tail lamp! 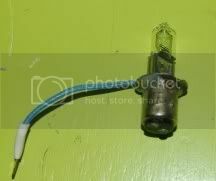 For some strange reason, those are not available either, however I discussed the wattage problem with our local Repco dealer, and suggested that he might have something that I could fit into the base of a tail light. Here is a tail lamp and a 55watt Quartz Halogen lamp. It took a bit of smashing (of glass), scraping (of innards) and soldering and filing, but I ended up with this little device. Tried it out and Voila! It works. So that is how I managed to prepare the film, this afternoon, covering part of a trip to Perth, which I have already listed in 'Transport and Motoring in General'. Now back to the ancient spools of film to see if I can find some more! Necessity - the mother of invention! EDIT: I've just watched the clip and thoroughly enjoyed it, especially the music, just perfect in my book. Would you mind if I posted the clip on an American classic car web site I visit, I'm sure the guys there would enjoy your adventure? No worries if you preferred I didn't, no offence taken on my part and none taken on yours I hope for asking. Fantastic. Are all Australians mad, or is it just the old car owning fraternity? a team of 3 Jowett Bradfords has just finished some 3000 miles plus epic there! We just don't like walking. I think one of those Bradfords is the beige one I spoke of in an earlier post. If you have fully restored an old car, then surely it's a matter of personal pride to do some incredibly long journey in it! It proves that you knew what you were doing all along! Your solution looks pretty good but if you want an original try this guy.. I am quite happy for you to do so, Scotty. Although you will see on the film that I claim copyright, that is mainly just in case someone is tempted to use it commercially in some way. I am very happy to share film, pictures etc. especially if it helps the old car movement in any way. I do ask though, that where it is possible, acknowledgment of the source is made and again where possible, some link back to me so that I can read and reply to any comments and questions. In the late 1950's I was a member of the Veteran Car Club of Australia, based in Melbourne. The club motto was 'Dementia Prodest', which I believe would translate as 'Madness Helps'. Not sure if the organisation has the same motto now! Thanks Peter, a very useful site to know about. 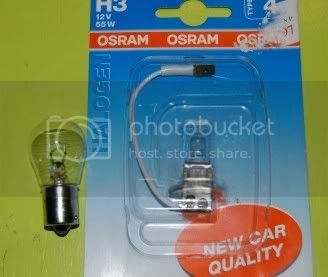 He has got the bulb for my projector, but at $43.00 for it, I might just continue to use my modified version which cost me less than $2.00 and a little time. I will certainly keep him in mind for the future. Thanks rd - however I can't guarantee that somebody might be tempted to use it commercially, so I think the safest solution is for me not to post it.